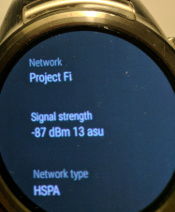 Wear OS LTE smartwatch Google Fi | Michael Hirsch, Ph.D. If using a data-only Google Fi SIM, you might consider shutting cellular “off” when not needed. The free data-only SIM instead of the phone/voice for smartwatch is an excellent value on Google Fi, sharing Google Fi data bucket with the main phone. data only FREE adding a data-only SIM to a Google Fi plan. Add up to 9 devices such as tablets, watches, old smartphones, etc. SMS does not work from a data-only SIM. voice/text/data $15/month additional using voice/text/data Google Fi SIM. Google Fi/Google Voice will not number forward to other Fi devices. That’s $50/month total for phone + LTE smartwatch on Google Fi for 1.5 GB of shared data. Users that don’t like to carry their smartphone (e.g. while exercising) and need voice calls may want the voice/data SIM for their LTE smartwatch. Also this voice/data SIM in the LTE smartwatch is a convenient backup phone for those who need to have two phones for reliability (on-call, VIP, etc.). You will have data-only (no phone on watch, texts via phone) LTE Google Fi smartwatch. 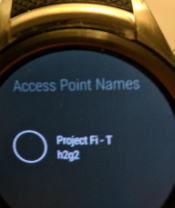 A Wear OS watch will function semi-independently AS LONG AS your smartphone is on and internet connected somewhere in the world using get LTE or WiFi for emails/phone texts/et al. E.g. you forgot your smartphone at home on the charger–you will get emails etc. on your Wear OS smartwatch over Wifi or LTE. Google Fi says that devices compatible with T-Mobile will generally work with Google Fi. I notice that the device is on T-mobile normally and may roam to AT&T (not guaranteed to roam, per Google Fi terms of service). Google Fi / Google Voice will NOT number forward to another Fi device. Maybe a third-party number forwarder would allow one phone number to ring watch and phone. The Google Fi app will break out the usage for each data-only SIM separately, so you can see what the LTE smartwatch vs. tablet vs. phone is using.